The University of Alcalá was founded in 1499 by Cardinal Cisneros. It is one of the oldest universities in Europe. UNESCO granted the University the distinction of World Heritage Site in 1998.
received this email from Vista Higher Learning, a foreign language book publisher. If you are creative and have a talent for making videos, here is an opportunity to make some $$$. It’s that time of year again! Last year language students from colleges and universities around the country submitted fun and meaningful videos to Vista Higher Learning’s Language Learning for Life video contest. Six lucky students won $500 to put toward things like study abroad opportunities and textbooks. Students, instructors, and the Vista team enjoyed the contest so much that we are holding it again this year! We will once again ask your students to make a video that demonstrates how they think language study will benefit their local community or the wider global community. For contest details, and to watch last year’s winning videos, visit VistaHigherLearning.com/supportlanguages. Next Spring we are offering the following courses. Click on the course number for more information. Summer Spanish courses will be offered in Montevideo. Classes are small and students benefit from individual attention inside and outside the classroom. Experienced, dedicated, and diverse faculty use current techniques and incorporate technology-based instruction. The summer program provides real-time and on demand access to current media resources and the latest in classroom language learning technology. The Language Institute offers its students a gateway to an exceptional academic community at Georgetown University, a range of summeractivities in the Summer School, and state-of-the-art language opportunities. Arabic: A comprehensive undergraduate program of intensive and non-intensive learning in Modern Standard Arabic will last ten weeks, with courses in basic, intermediate advanced as well as media Arabic. In the Pre-session, Teaching Arabic as a Foreign Language will be offered which is open to both graduate and undergraduate students. Content Arabic: Advanced Arabic language courses for advanced high learners are taught entirely in Arabic.. They offer undergraduate and graduate students essential subject matter learning (linguistic, cultural and political) while building their language proficiency. Courses include Arab Politics in the Middle East. Colloquial Arabic: Undergraduate courses in spoken Egyptian, Iraqi, and Levantine Arabic will be offered with continuation in the Second Session. These courses are not open to native speakers of Arabic, heritage speakers of Arabic, or students who have completed three years or more of Arabic at Georgetown. Persian: In cooperation with the Division of Eastern Mediterranean Languages, three Persian courses are offered at the undergraduate level. Intensive First Level Persian and Intensive Second Level Persian as well as non-intensive First Level will be offered both sessions. Non-Georgetown students accepted into this Language Institute are eligible to apply for a partial tuition scholarship offered by Georgetown University (Please see Financial Information). For further information and special application forms, please contact the Scholarship Coordinator, SummerSchool Georgetown University, 3307 M. Street, N.W., Suite #202, Washington, D.C. 20007. Tel: (202) 687-8700.
or the Arabic Department at arabic.georgetown.edu. 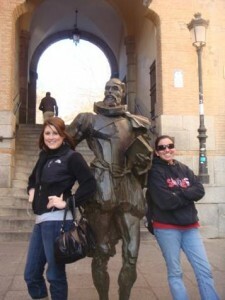 Lauren Johnson’s blog, connecting Montevideo with Costa Mesa, CA. Lauren Johnson, an International Studies major now in ACU’s Study Abroad program, started writing a blog, Tráigame Uruguay, about her experiences in Montevideo. The Costa Mesa, CA, newspaper wrote an article about how Lauren’s blog is helping her former teacher, Christine Navakovich, Spanish teacher at Mariners Christian School, teach second-graders Spanish and learn about Latin American culture. The American Conference on the Teaching of Foreign Languages (ACTFL) with nearly 7,000+ members nation-wide, highlighted the story in this month’s brief. Over seven thousand foreign language educators across the United States have seen how an ACU student is using mobile technology while at ACU’s Montevideo program to connect Montevideo with her home town of Costa Mesa, CA. Read all about it: Daily Pilot – Serving Newport Beach & Costa Mesa, California.